Memory Protection Devices offers a wide assortment of six different holders for CR2/3A batteries, which are commonly utilized in digital cameras and other consumer electronics. Our choice of 2/3A battery holders range in height from 12 mm to 20 mm above the PCB. These batteries holders feature pressure contacts and bodies that are constructed out of a variety of materials, including Nylon’s and PBT’s. 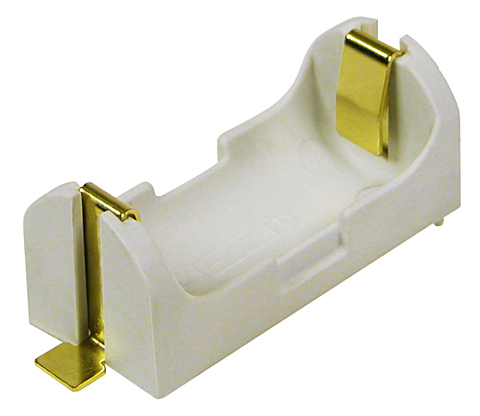 For example, MPD offers the BH 2/3A-SM, a 2/3A battery holder, which is constructed of off white Nylon 66, with gold flashed nickel-plated pressure contacts for improved conductivity and anti-corrosion protection. The BH2/3A-SM, CR2/3A battery holder also features SMT termination. 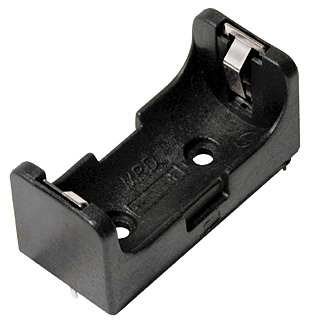 MPD also offers various 2/3A battery holders for through hole mounting, including the BH2/3A, BH2/3A-3, BC2/3AE, the 6S-23A, and the BH123A. The BH123A features a ‘scooped out’ base that allows the CR2/3A battery to sit as close as possible to the PCB to reduce height, as well as the nickel-plated steel pressure contacts that feature reverse polarity for added electrical protection. If the application potentially involves extreme shock or vibration, it may be advisable to utilize the optional BC2/3C retainer strap, which delivers added safety protection in case the device is dropped or mishandled, as the BC2/3AC retains strap fits all MPD 2/3A battery holders. BH2/3A-SM. 2/3 AA battery holders.